This mermaid paper bag puppet craft is such a fun paper bag craft idea for toddlers and preschoolers! 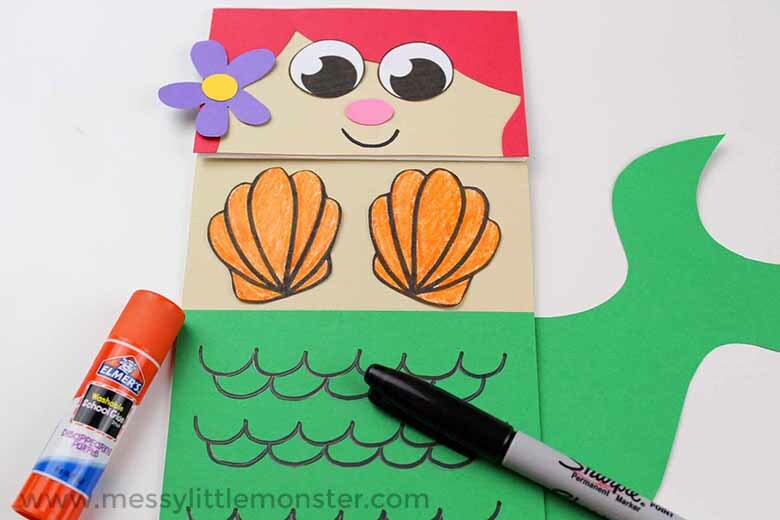 We have included a free printable mermaid puppet template to make this under the sea activity really easy for you to make with the kids. 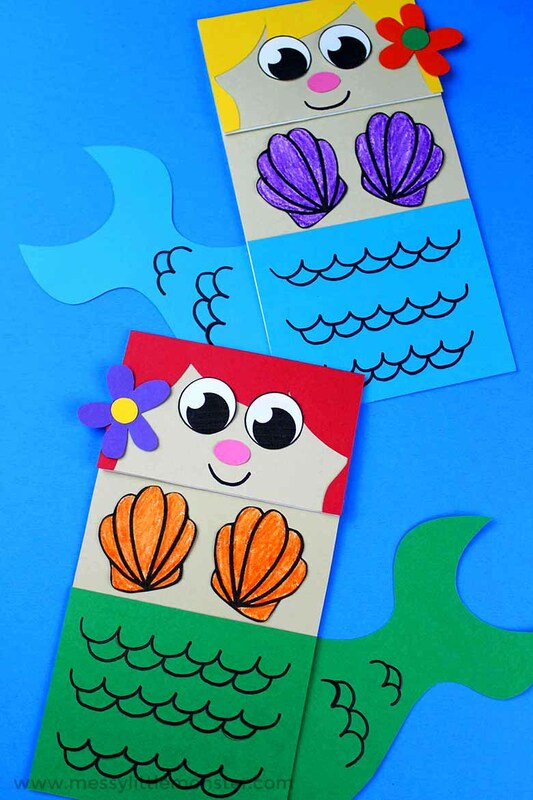 Just download and print the mermaid puppet template and follow the step by step instructions for your under the sea theme paper bag craft! If you want to have a go at making a few more paper bag puppets you might like to have a go at making a set of pirate paper bag puppets. 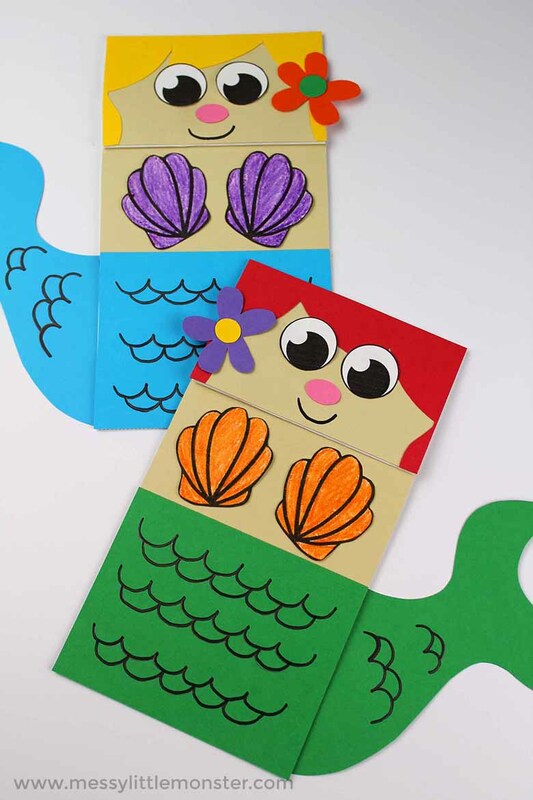 Below you'll find step by step instructions for how to make a mermaid paper bag puppet using our free printable mermaid puppet template! 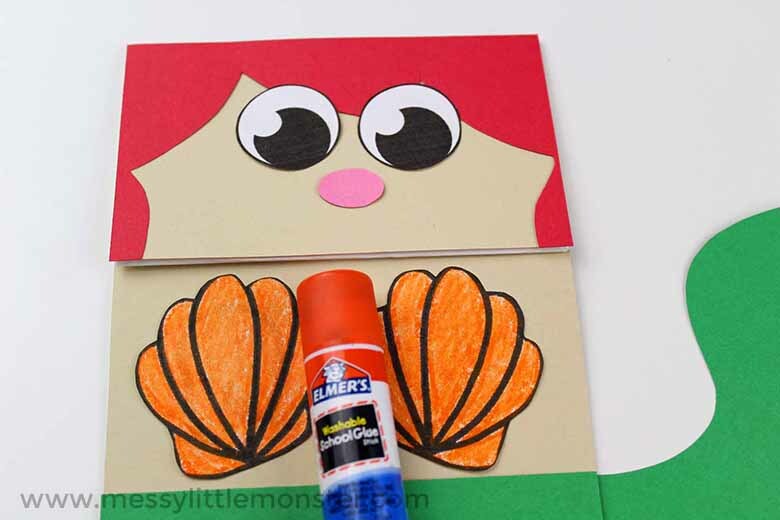 This under the sea activity would be a great paper bag craft for a party or playdate with your toddlers or preschoolers. They'll have so much fun helping put the mermaid puppet together and playing with it after! The puppet shows that young children put on are the best! Before you begin, I highly suggest gathering all your supplies. 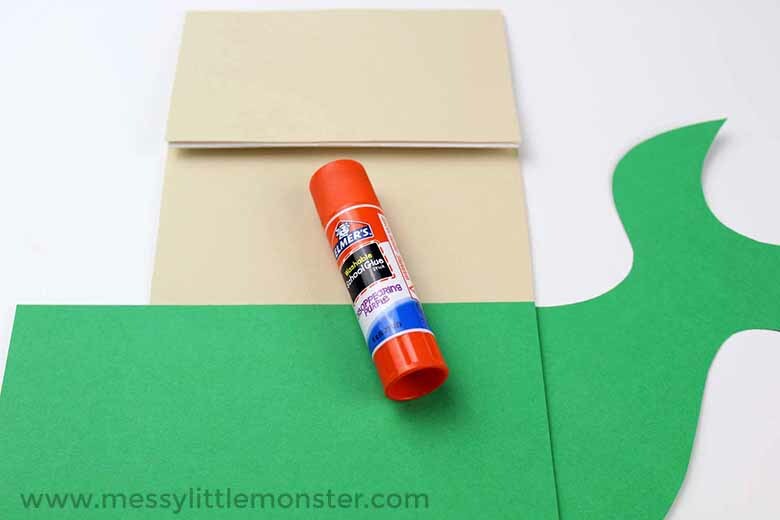 This will make creating your paper bag craft so much easier - especially since little toddlers and preschoolers are involved! Make sure you have your mermaid puppet template downloaded and printed out as well. You can get that by scrolling down below. Assuming you have your mermaid puppet template downloaded and printed out, it's time to cut it out! Once you've done that, cut large squares of flesh tone coloured card stock or construction paper to glue onto the paper bag. You'll want them large enough to cover the paper bag in its entirety as pictured below. Make sure to glue them on the side where the bottom of the bag flaps up. Use scissors to trim off any excess paper from the edges. Now, it's time to start creating the mermaid tail! 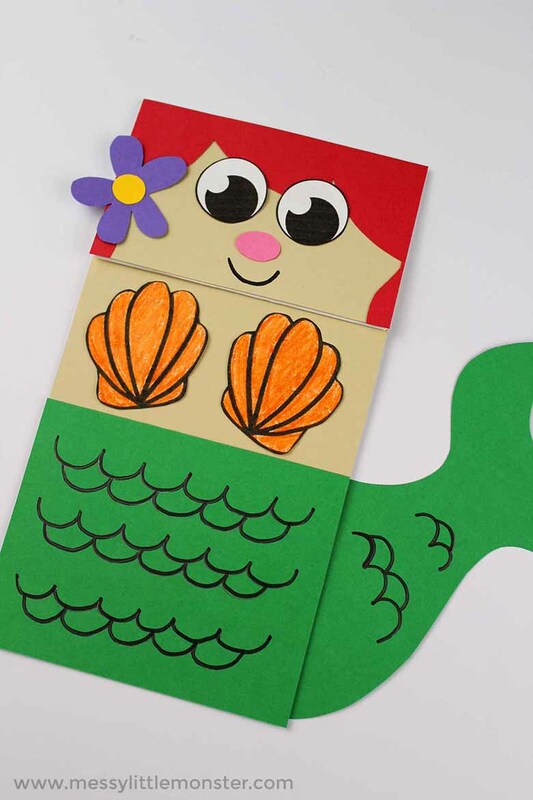 Using the mermaid puppet template, trace the mermaid's tail onto your desired coloured paper and cut it out. I used green as you can see pictured below, but you can use any colour you want. Sparkly paper would look amazing! 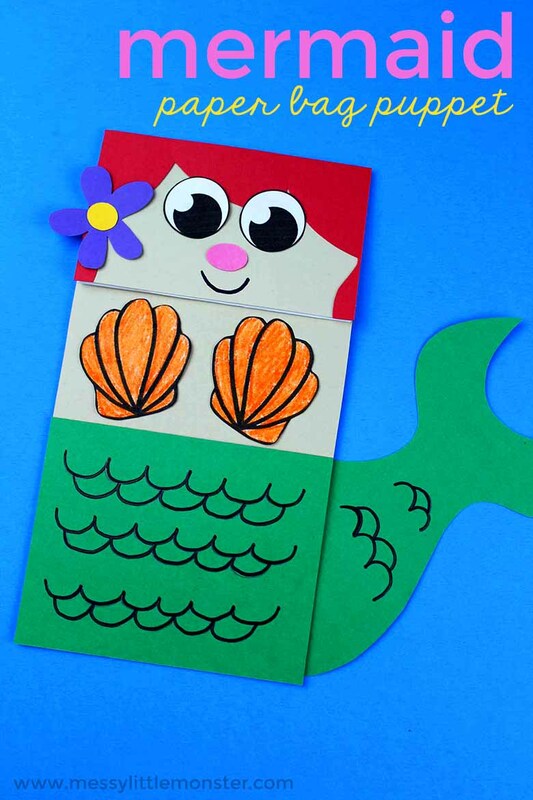 Using the same colour as the mermaid's tail, cut a square of paper and glue it onto the bottom of the paper bag. Cut off any excess around the edges using scissors. Once you've done that, glue the mermaid's tail onto the back of the paper bag. You want to make sure it aligns with the coloured paper you just glued on. Next, grab your crayons and have your toddler or preschooler choose their favorite colour to colour in the seashell bra. Once it's all coloured in, cut and glue each one to the front of the paper bag. It's time to create the mermaid's hair next! 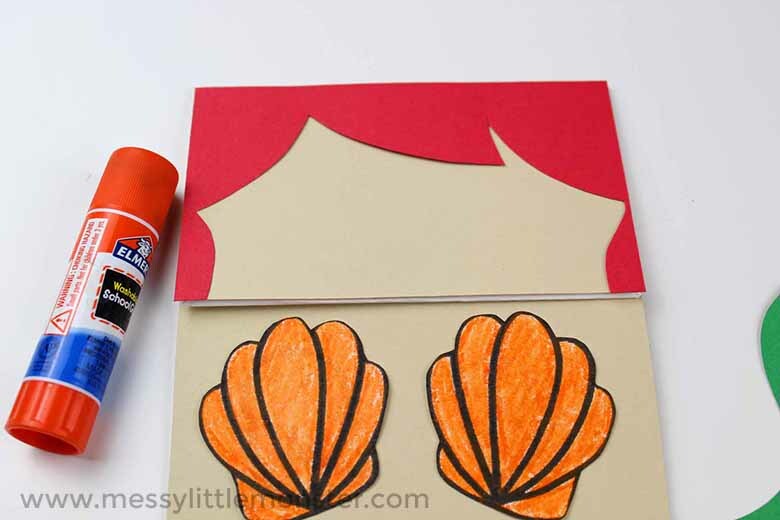 Using the mermaid puppet template, trace the mermaid's hair onto your desired coloured paper and then cut it out. We chose to use red paper as you can see pictured below. 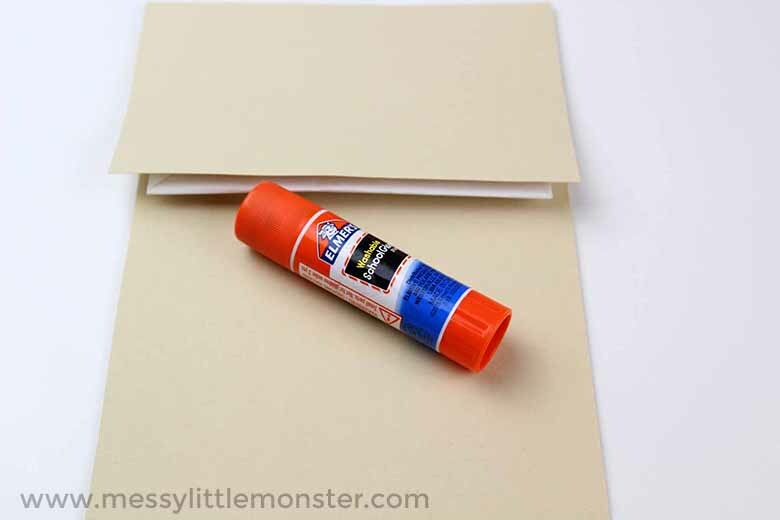 Once you've done that, glue the hair onto the top of the paper bag as you can see pictured below. Use your scissors to trim off any excess paper around the edges. Now we're going to create the mermaid's face! Trace a small oval onto light pink paper, this will act as your mermaid's nose. Glue it onto the center of her face below the mermaid's hair from the previous step. Then, cut out the eyes from the mermaid puppet template and glue them right above the nose. We're almost finished with the mermaid paper bag puppet! Using a black marker, add a smile to the mermaid's face and scales to the tail. Then, cut a flower from your desired colored paper and glue it onto the mermaid's hair as pictured below. And that's it! You now have a fun paper bag craft that fits an under the sea theme that your toddler or preschooler will love! 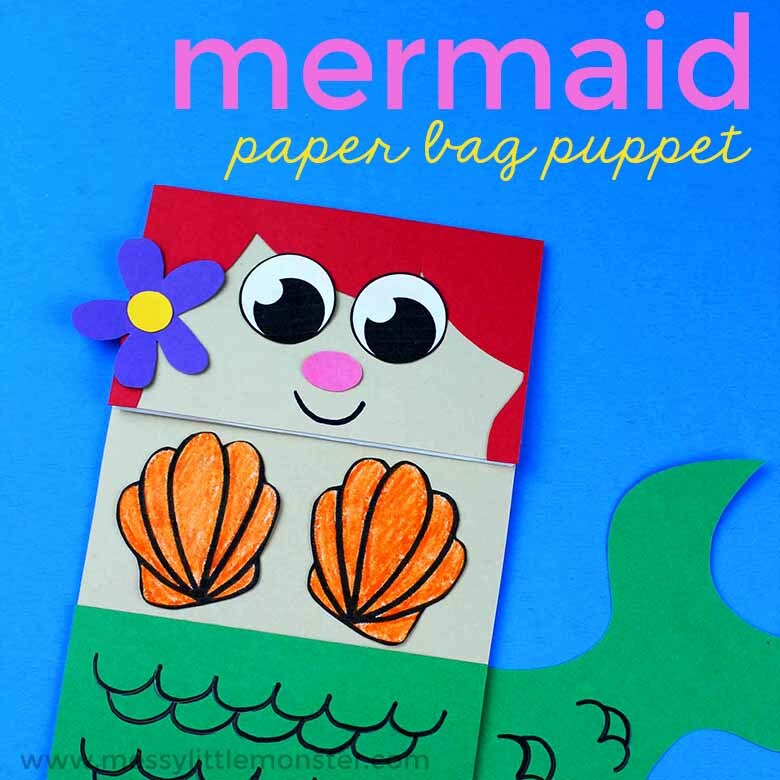 They'll have so much fun playing with their mermaid paper bag puppet. To download this printable mermaid puppet for free add $0 and click on the 'I want this' box below. It may take a moment for the page to load so please be patient. If you're looking for more puppet ideas, your toddler or preschooler will love these spoon puppets or these puppets made from craft sticks. They'll especially love these puppets from nature! 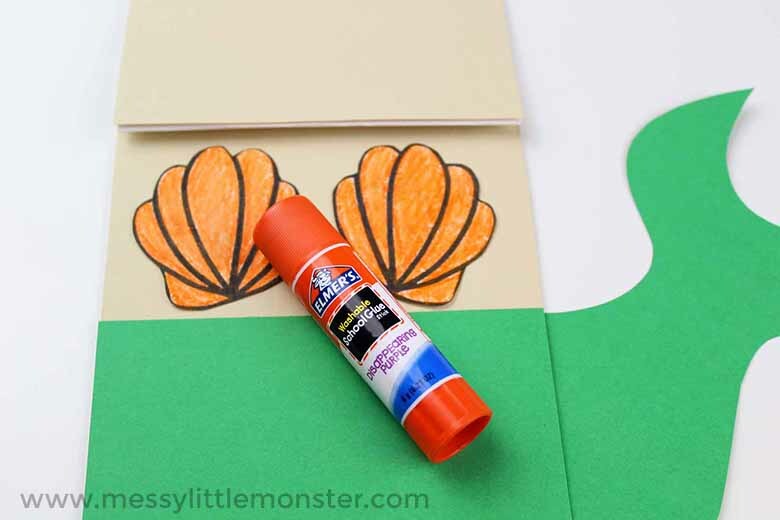 Toddlers and preschoolers will have so much fun with this under the sea activity! 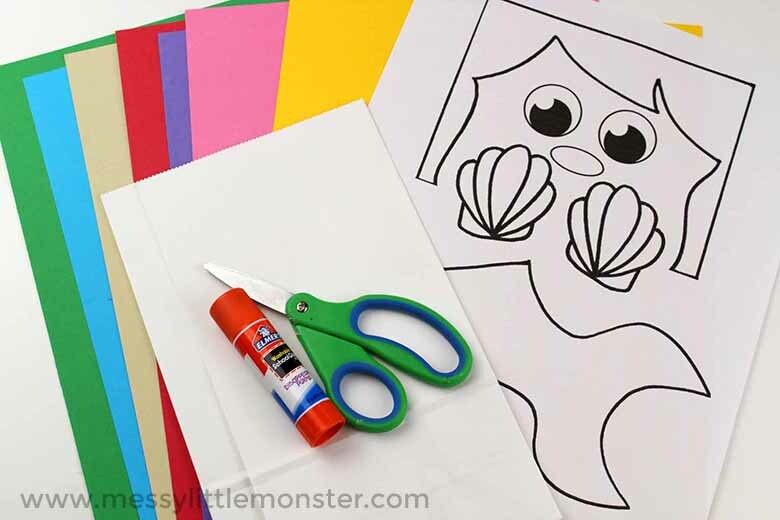 Making a mermaid paper bag puppet is such a fun paper bag craft and the mermaid puppet template makes it easy for kids to put it together. Children will love helping to make this under the sea craft and playing with it making up puppet shows for hours after!